This map contrasts the federal structure of the Federal Republic of Germany with the centralized structure of the German Democratic Republic. 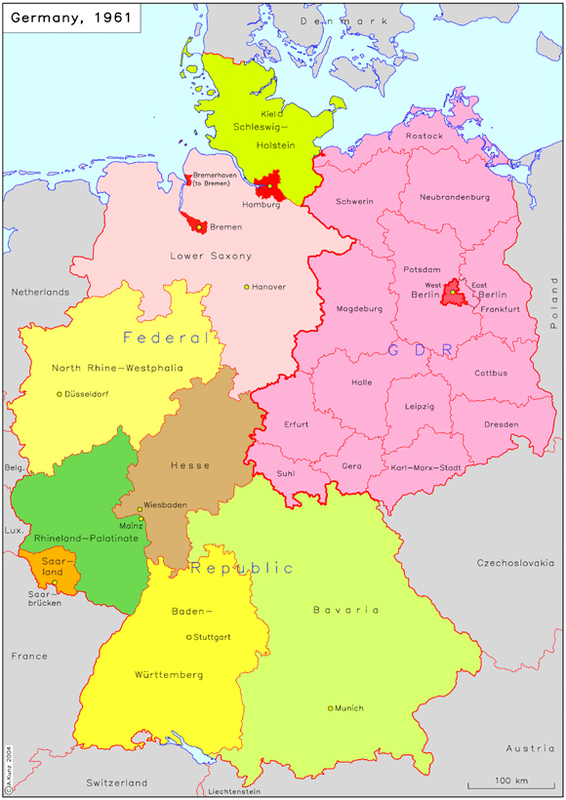 The Federal Republic was made up of ten federal states [Bundesländer]: the territorial states of Baden-Württemberg, Bavaria, Hesse, Lower Saxony, North Rhine-Westphalia, Rhineland-Palatinate, Saarland, and Schleswig-Holstein, as well as the city-states of Hamburg and Bremen. In 1952, the former states [Länder] of the GDR were replaced by fourteen districts [Bezirke] under the control of the central government in Berlin (East). According to Allied stipulations, Berlin constituted a special zone. Nonetheless, the respective governments in East and West followed a de facto policy of incorporating the sections of Berlin that belonged to them into their own administrative structures – even though this could be challenged by the opposite side on a de jure basis. West Berlin was frequently viewed as an eleventh federal state. On account of its special status, however, it could only exercise a limited right to representation in Bonn’s upper and lower houses of parliament (the Bundesrat and Bundestag, respectively). The East German government, on the other hand, treated East Berlin as a fifteenth district of the GDR.